Green Screen: A More Common Video Effect Than You Might Realize! Green Screen is a remarkably common video production technique that enhances most every movie and television show you watch. Next time you plop down in your favorite easy chair to stare at the tube, pay close attention to backgrounds, hairlines, and shadows. That’s where you’ll see the telltale signs of green screen. Maybe. If it’s not done 100% right, you’ll see green tinges and uneven mixing. That sort of mistake is rampant in cheap online videos but of course in a big budget TV show or movie there will be no green tinges. Green screen done right will look completely and totally real, even though it’s totally fake. Watch the video above and see if you realized those scenes were done using chroma key. 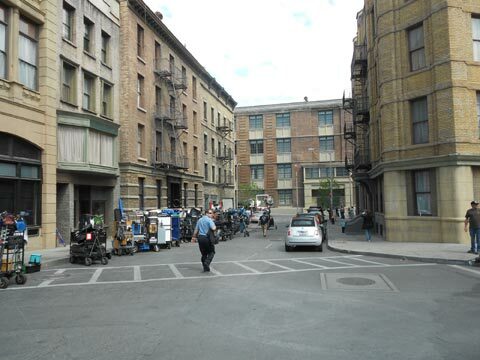 These building facades are part of the sets found at Paramount Studios in Hollywood. If you’re like most people, you are completely fooled by the wizardry of green screen. You probably think you’re looking at shows shot on location with real backgrounds and not stage props. So sorry to inform you that you’re wrong! Don’t take it personally. Green screen is meant to fool! Watching the video at the top of this page will remove any doubt about how often you are fooled by green screen and fascinate anyone familiar with these popular TV shows and movies. As you’ll see in the video, often it is just a portion of the shot that is filled in with green screen backgrounds, but sometimes every single pixel of the shot, outside of the actors, is green screen. 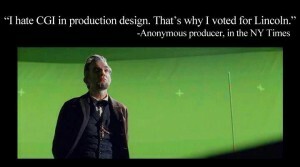 Green screen effect from the Steven Spielberg movie, Lincoln. The cross marks you see on the green screen are a focus aid. WHY IS GREEN SCREEN TECHNIQUE SO COMMON? Simply put, green screen saves money and enhances creative potential. Movies like the Life of Pi or Alice in Wonderland would be completely impossible to produce without green screen. Ugly Betty would just be cheaper to produce, but that’s reason enough. Put this child on Mars using Chroma Key (GREEN SCREEN) technique! It’s so much easier to create video in a studio where you have total control over the lights, sounds, and people present. Do you really want that airplane flying overhead interfering with your sound? Do you want to take a video crew out where curious onlookers will stand there gawking, calling out, and might even try to get into the shot so they can wave at their moms? Instead, have your actors in a studio with dark green-screen pillars that will later be replaced with images of the actual pillars of the actual Capitol building where this scene is supposed to take place. Even if you’re not doing such a massive project, but rather want to do something more modest like sell skiing jackets, green screen can transport your models to the slopes without having to pay for a crew to travel outside of the studio. In other words, even mom and pop video producers can use green screen to great effect. Green screen is one of the truly “magical” things about digital video production. You can locate your video anywhere in the universe if you use green screen technique. Click here for a series of before and after pictures using the green screen effect in popular movies. For the low-budget production, the best advice is brightly and evenly lit shots, with good back light for your actors. That helps them stand out visually from the background which aids in making the green screen effect more realistic looking. You want the background light to be as even as possible over an evenly-colored green background. (Actually any color can be used but that is another post.) Shadows on the background create pockets of darker color and that will make getting a good mix difficult. Folds and wrinkles can also cause the color to appear uneven. Green screen is a remarkably effective and common video special effect. With the proper equipment and lighting, green screen will appear incredibly realistic. I dare anyone to examine the video footage posted on this page and find the typical markers of green screen. Nope, you can not see those tell-tale green shadows or outlines, so I swear these shots look 100% real. Next time you’re laid back and soaking in some quality visual entertainment at the movies or at home, keep green screen technique in mind! About the author: Lorraine is a longtime video producer who loves sharing her passion for video production with her readers. She designed this blog for beginners and intermediate level video producers who want either to use online video to promote themselves, their business or causes, and budding documentary filmmakers who want to change the world with their awesome videos! Contact Lorraine for assistance with your video projects today! Even savvy film viewers can be suckered by the realistic green screen effect. This producer obviously did not realize Lincoln used green screen quite extensively. After posting this last night, I heard from a reader, Andre Campbell, who works in the midst of it all in Los Angeles. I wanted to share his tips with everyone since they are so awesome! Get your background first, then you light your scene according to how the background is lit, and not the other way around. Done for safety. Makes a bridge five feet off the ground looks like it is a 105 feet off the ground. Safer environment in and around for the crew. The ‘x’ markings you see on the green screen are there for tracking. Most times, the green screen is out of focus, (for reasons of depth of field). This makes it difficult for the computer to latch onto something for tracking. The ‘x’ markings show up better in the out of focus background. When it comes to people waving at us in the street, we can pretty much lock down the streets we shoot on. In L.A. we have off duty or retired cops working with us. They are in full attire with gun and motors. (motor cycles) They help with controlling street traffic and ride along on tow shots. If people ask why there are only some shots with just a piece of green, and you can still see things, is because they key out the green then garbage matte out the rest. Also when we have (sorry had-we got canceled) 100 extras (Paramount back lot of D.S.M show) and we are going to do a green screen shot, we have to check the extra’s clothing, making sure they have on colors that will have no problems when they cross the Green Screen. Just a thought and my two cents. Wonderful article. Hit it right on the nail. The more you do it and understand it, the better G.S. person you become.